Hello everyone. How was your week? I was so happy when my order from Bellast finally arrived last week. Well, what is Bellast anyway? Bellast is your online jewelry shopping destination. In 2010, they opened the world of fashion and fine jewelry to everyone at an affordable price. 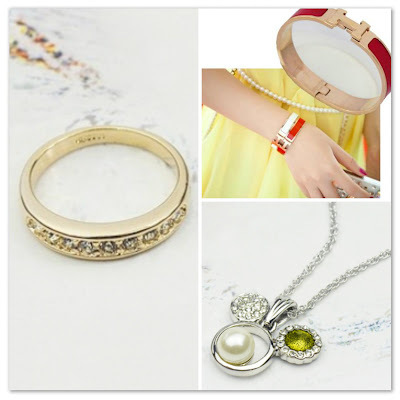 They're one of the largest global online retailer of crystal jewelry, 925 sterling silver jewelry, and pearl jewelry. Shopping online with Bellast.com is easy, fast and convenient and they offer many different payment options. They accept PayPal, Credit Cards (Visa, Mastercard, American Express, Discover and etc. ), Debit Cards, Western Union and Wire Transfer as their payment methods. Finally last week, I received my own share of their jewelries. Here's what I ordered. Glad it arrived before the big day of my boyfriend Jaycee. I actually gave him the other ring I ordered as a gift. I got two same rings in different sizes, (the photo on the left above) and gave it to my boo for our couple ring. We actually had another couple ring before but Bellast ring was just so amazing to the eye. How could I say no to such elegant piece. How lovely it is, right? If you want to get the same ring on the photo above, you can get it here. They got wonderful rings and other pieces too. This is my most favorite since both my boyfriend and me had this. I think this is a Mickey Mouse inspired necklace. This cutesy piece is one of my faves as well. Check it out here. Dainty indeed. Plus this bracelet that caught my eye never failed to amaze me. A red bracelet will never go wrong with jeans and a shirt or even dainty dresses. Get the same item here. I hope to find time to use these items for an OOTD post but haven't got the time yet. I wore them for photos and for you to have a closer look. The pieces are really beautiful and I hope that the photos speaks for themselves. Another online shop to watch out for! Those are pretty purchases! I think it was just after a week. your couple ring is so pretty! i like it, too! and the red bracelet is LOVE! yay, i'll go visit the site. hihi! thanks for sharing! I love the couple ring! It can be mistaken as a wedding ring. The bracelet is very pretty and girly with a bit of oomph! Do they have some pandora like bracelets with charms?